Track Takeover. You’ve heard the name by now, for sure. “Your feet meet our pavement….” “The track is yours!” Our taglines sure are catchy, but they don’t quite tell you what to expect from this year’s event – or why ours is unlike anything else you’ve ever seen before. We were the first to swing open our gates to the fans three years ago. Other tracks thought we were crazy when we thought up the idea – why are we giving away access that fans would pay for? Because for us, it’s all about the race day experience for the best fans in sports. We were so excited to bring that one-of-a-kind experience to our fans first – and for FREE. 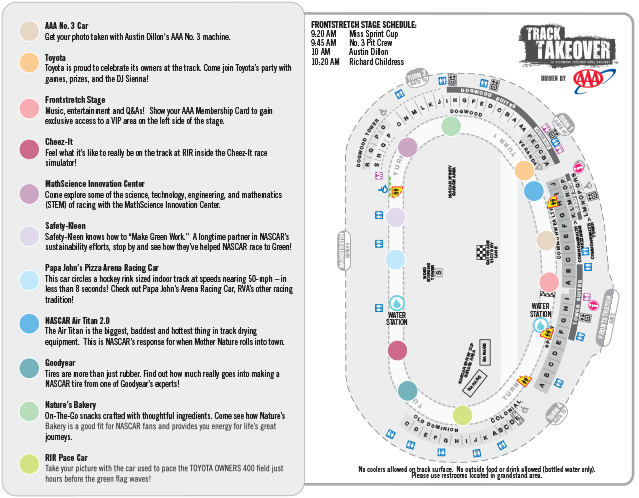 So, we’ve had three years under our belts to make Track Takeover even better. Here’s what you can expect this year, driven by our friends at AAA. 9:00 am – Track Portals Open – Track Takeover driven by AAA begins! 11:15 am – Track Takeover ends, get ready to go racing! All of this is hosted by Michael Blair, emcee extraordinaire. Plus, make sure to sign the start/finish line too, just hours before the green flag waves to kick off the TOYOTA OWNERS 400.